The coffin-like structure appearing on this card is most possibly an iron maiden. In the manga, the effect of destroying an opponent's monster is treated as destroying by battle (through the combined attack of the two Spellcaster monsters), evidenced by the fact that The Winged Dragon of Ra can be destroyed through this effect despite its immunity to Spell/Trap Card. The card Dark Burning Magic is based on the instance of Magical Dimension being used in the manga, with Dark Magician and Dark Magician Girl. Fortune Lady Water: If you Special Summon "Fortune Lady Water" with "Magical Dimension" and then destroy the only other "Fortune Lady" monster you control, you cannot activate the effect of "Fortune Lady Water". Summon Reactor・SK: If “Magical Dimension” Summons a monster and destroys “Summon Reactor ・SK”, then 800 damage is not inflicted to the opponent. But if “Magical Dimension” destroys a different monster instead, then “Summon Reactor ・SK” will inflict the 800 damage. It cannot be activated during the Damage Step. The application of "Tribute that target, then Special Summon 1 Spellcaster-Type monster from your hand" and the application of "then you can destroy 1 monster on the field" are not treated as being done at the same time. Even if the only monsters on your field and unaffected by Spell effects, if there is a Spellcaster-Type monster on your field, you can activate "Magical Dimension". Furthermore, if the monster targeted by the effect of "Magicial Dimension" is unaffected by Spell effects due to the effect of "Forbidden Lance" etc., the monster cannot be Tributed by the effect of "Magicial Dimension" and the effect is not applied. ("Special Summon 1 Spellcaster-Type monster from your hand" and "then you can destroy 1 monster on the field" are also not applied. ): Can a monster unaffected by Spell effects be Tributed by the effect of "Magical Dimension"? If "Vanity's Emptiness" is activated in Chain to the activation of "Magical Dimension", only "Tribute that target" is performed. (Special Summoning a Spellcaster-Type monster from the hand and destroying a monster on the field cannot be performed. ): If "Vanity's Emptiness" is activated in Chain to the activation of "Magical Dimension", what happens? Apprentice Illusion Magician: Even if "Apprentice Illusion Magician" is Special Summoned with the effect of "Magical Dimension", its effect that adds a "Dark Magician" from the Deck to the hand can be activated. 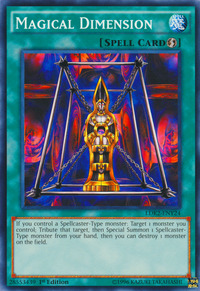 (Even if "Magical Dimension" was activated as Chain Link 2 or higher and Special Summoned "Apprentice Illusion Magician", the monster effect of "Apprentice Illusion Magician" can be activated after that Chain resolves. ): If "Apprentice Illusion Magician" was Special Summoned by the effect of "Magical Dimension", can that monster effect be activated? Tributing a monster for "Magical Dimension" is not a cost; it's part of the effect and happens when the effect resolves. If the effect of "Magical Dimension" is negated then you do not Tribute a monster. You don't have to destroy a monster when using "Magical Dimension"; it's optional. If you do choose to destroy a monster, then it's resolved at the same time as the rest of "Magical Dimension's" effect. Because you select which monster to destroy when "Magical Dimension" resolves, (not when it's activated) "Magical Dimension" does not target. You cannot activate "Magical Dimension" unless you have a Spellcaster-Type monster in your hand that can be Special Summoned with its effect. If your opponent activates "Magical Dimension" and chooses not to destroy a monster on the field, then you can activate "Torrential Tribute" or "Bottomless Trap Hole" to destroy the Special Summoned Spellcaster. If your opponent does decide to destroy a monster, then you cannot activate these cards because the last thing to happen was not a monster being Summoned. So you have missed the timing. You only need a Spellcaster-Type monster on the field when you activate "Magical Dimension", not when it resolves. If your opponent chains an effect to destroy your Spellcasters, or flip them face-down, "Magical Dimension" still resolves as normal. Also note that you can Tribute your only Spellcaster for "Magical Dimension's" effect and the rest of "Magical Dimension" will still resolve properly. You cannot Tribute a monster for "Magical Dimension" that is "Unaffected by Spell Cards" since Tributing is part of the effect of "Magical Dimension" (not a cost). If the only monster on your side of the field is "Gemini Elf" while "Non-Spellcasting Area" is active, then you could not activate "Magical Dimension". You can Tribute a monster that was targeted by "Soul Exchange" for "Magical Dimension". You cannot chain "My Body as a Shield" to "Magical Dimension", since destroying a monster on the field is optional. If you Summon a monster like "Skilled Dark Magician" and the opponent activates "Bottomless Trap Hole", you can chain "Magical Dimension" to Tribute "Skilled Dark Magician" and Special Summon another Spellcaster from your hand. This new monster will NOT be destroyed by "Bottomless Trap Hole". 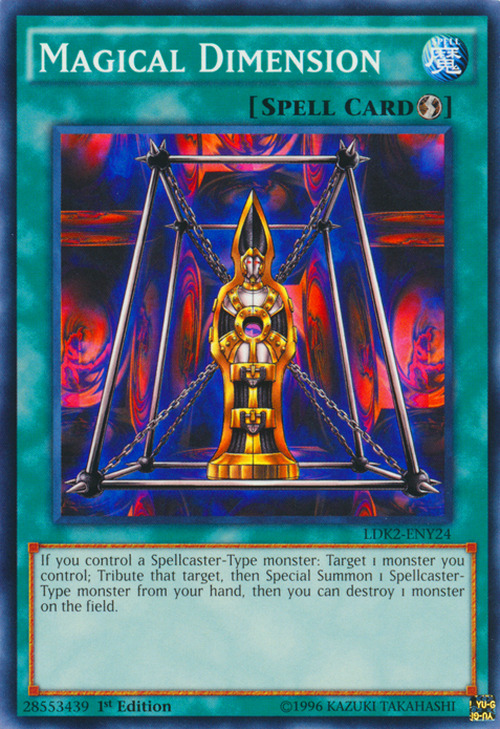 Destruction Jammer: "Destruction Jammer" cannot be chained to effects that may or may not destroy a monster, like "Magical Dimension" . Prime Material Dragon: You cannot chain “Prime Material Dragon's” effect to “Magical Dimension”, since destroying a monster on the field is optional. If you Special Summon "Dark Magician of Chaos" with "Magical Dimension", then decide to destroy 1 monster on the field, then you will NOT get the effect of "Dark Magician of Chaos" because it misses the timing. If you choose not to destroy a monster, however, then his effect will activate. (See rulings for "Dark Magician of Chaos").The latest print of "Dark Magician of Chaos" uses Problem-Solving Card Text, which makes it clear that its effect activates during the End Phase of the turn it was Normal or Special Summoned, not when it is Summoned. This also means that its effect cannot miss the timing and cannot be part of Simultaneous Effects Go On Chain. This difference is due to a major change in the functionality of "Dark Magician of Chaos".